This Apple MacBook laptop works on an Intel Core i5 processor. 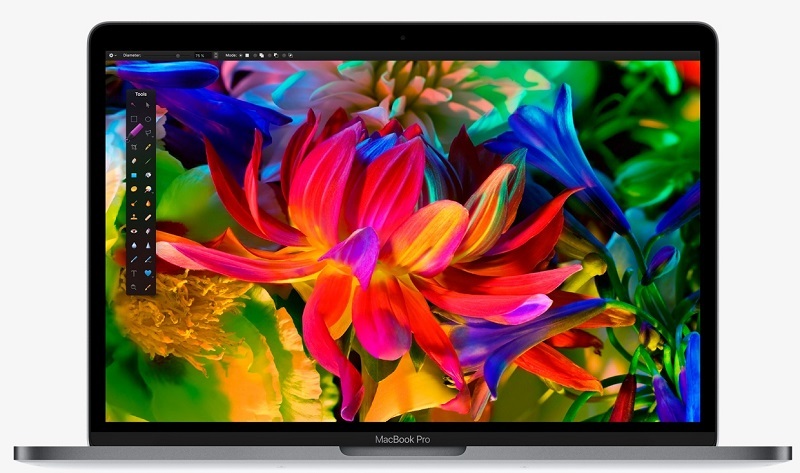 The Apple MPXT2 MacBook Pro Laptop lets you tackle all your daily computing tasks like a pro. It flaunts a sleek and lightweight design that looks appealing. It comes with an HD Webcam along with an integrated microphone so that you can make crystal clear video calls and stay connected to your friends and family. Also, it has stunning stereo speakers so that your entire family can sit together and enjoy movies and web series on its 13inch screen. The screen with IPS technology gives you splendid entertainment with its stupefying clear, sharp, and bright visuals. For a non-stop entertainment session, this MacBook Pro is equipped with a powerful battery that that, once fully charged, runs for up to 10 hours nonstop. The 8GB RAM and 2.3GHz, Intel Core i5 Dual-Core processor, comes together to provide this Apple laptop with all the power and efficiency it needs to handle heavy-duty games. Moreover, this laptop features an Intel Iris Plus Graphics 640 card that enables you to enjoy your time by playing video games. Thanks to the 256GB SSD, you can store all your HD videos, work files, and multimedia content in one place and carry them wherever you go and enjoy an endless entertainment session. The Apple MacBook Pro Laptop runs on macOS Sierra that offers a user-friendly interface for an intuitive computing experience.